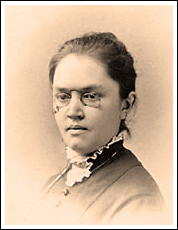 In 1893, Katharine Lee Bates, an English teacher at Wellesley College in Massachusetts, agreed to take a summer teaching position at Colorado College in Colorado Springs. During her 2,000 mile train trip through Chicago, Kansas and into Colorado, the 34-year old Bates became quite impressed with the beauty and vastness of the United States. One of the perks of being a visiting professor was a carriage ride up Pikes Peak. The horse-drawn carriage could not proceed past the Halfway House (Glen Cove), so they switched to burros for the remaining six miles of the trip. The original four stanzas were printed on July 4, 1895 in an issue of The Congregationalist newspaper. After several revisions, the final poem was published in the Boston Evening Transcript nine years later. Samual Ward’s hymn, “Materna” was selected as the music behind the lyrics. However, Ward died in 1903 and never knew how popular Bates’ lyrics and his music would become. A strong push was made to adopt the hymn as the national anthem in 1926. However, President Hoover chose the “Star-Spangled Banner” instead. In 1993, 100 years after Bates ascended Pikes Peak, Colorado Springs’ businessman Costas Rombocos donated an “America the Beautiful” monument that was placed atop Pikes Peak. The monument can be seen on the observation platform to the south of the Summit House. While Bates retained the copyright on her poem to protect it, she never sought any payment of royalties. It was her personal gift to the country.